Kosmochlor is a rare chromium sodium clinopyroxene with the chemical formula NaCr3+Si2O6. 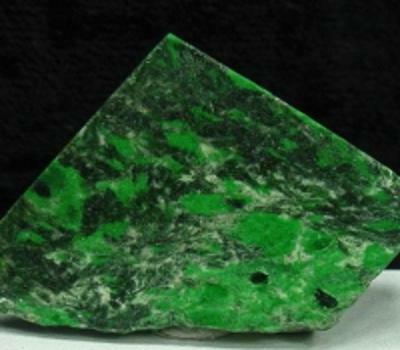 It is a monoclinic-prismatic emerald green mineral containing chromium, oxygen, silicon, and sodium. 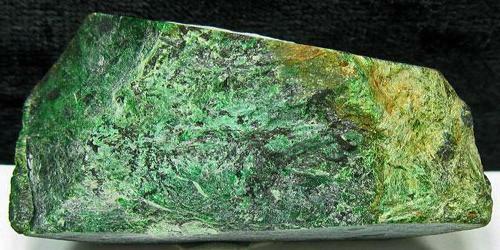 The name is from German kosmisch, for its occurrence in meteorites, and the Greek color, for green. It was first reported in 1897 from the Toluca meteorite, Jiquipilco, Mexico. Occurrence: A major constituent of some jadeitites; an accessory constituent of some iron meteorites. It occurs as a major constituent of some jadeitites and as an accessory mineral of some iron meteorites. Associated minerals include cliftonite (graphite), chromian diopside, troilite at Toluca; daubreelite, krinovite, roedderite, high albite, richterite, chromite (Canyon Diablo); and jadeite, chromite, and chlorite (Burma).